When it comes to llamas and alpacas Marty McGee Bennett has been an industry touchstone for over 20 years. NOW she can help you learn how to attain and maintain your ideal weight. Whether you have camelids, horses, dogs or cats, animal can help you see your struggle with weight in a totally new light. 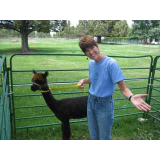 Using principles of balance instead of force that have helped thousands of camelid owners live harmoniously with their animals, Marty will show you how to use these same ideas to live in balance with your own body in her latest book "The Problem with Weight is NOT Losing it!" If you have gotten this far then I am assuming that you worry a bit about your weight or would like to lose some. I have struggled with my weight since I was a teenager, I have lost hundreds of pounds and unfortunately found them over and over. . I have never been obese but I have sure been called a BIG girl bumping 200 pounds at one stage. I am 5’10” and my weight has fluctuated between 30 and 50 pounds my whole life. I have always either been on a diet or unhappy with my weight. I have never weighed the same for more than a few weeks at a time. I was a “manic-depressive dieter”. I was either manically dieting or depressed that I was overweight. On December 28, 2007, quite by accident I made a discovery about weight maintenance that would change my life forever. The secret isn’t about what to eat or what not to eat, it doesn’t involve special meal plans or pills. Losing weight is calories in and energy expended- we all know how to lose weight. It is keeping it off that is the big deal the grand prize, the big deal, the brass ring. Learning to maintain your weight is more mental than anything else. What I figured out will help you win the mental game of weight control. Really! I know that repeated failure has made many of you very leery of trying to lose weight again. It is too hard. Let me and animals show you a different approach to getting yourself into balance and staying there. This book about animals and how working with and understanding animals can help you understand your own personal animal... your own body. Let your dog or your horse your llama or alpaca teach you how balance really works and then apply those lessons to your life. The new mantra is diets don't work and that is surely true- learning to eat in balance is a skill and getting good at takes practice and intention. My book will help you learn the skill of weight maintenance. My book arrived yesterday and I can't put it down!! You are a genius! Alpacas really are a metaphor for life! Your wisdom applies to every aspect of my life these days! Especially parenting!